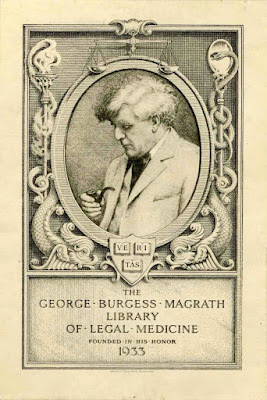 December 11, 2018 marks the 80th anniversary of the death of Dr. George Burgess Magrath. 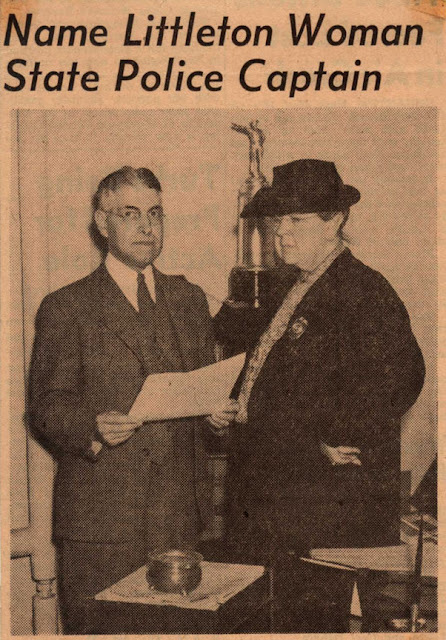 Regarded as the leading figure of his day in the field of legal medicine, his long friendship with Frances Glessner Lee led her to pursue this interest in the last three decades of her life, resulting in the creation of her famous Nutshell Studies of Unexplained Death. Magrath and Lee became acquainted as a result of his friendship with her brother George, which developed during the years that the two Georges attended Harvard University, class of 1894. They also shared the same birthday – George Magrath born on October 2, 1870, and George Glessner born a year later, October 2, 1871. 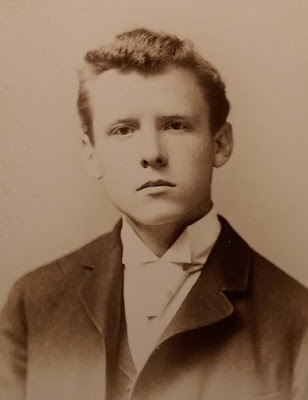 “George Burgess Magrath was born in Jackson, Michigan, on October 2nd, 1870. His father was the Reverend John Thomas Magrath; his mother was Sarah Jane (Herrick) Magrath. The father in his work moved from place to place, so that in the first twelve years of his life George was a resident in succession in Jackson and Battle Creek, Michigan, a suburb of Philadelphia and finally a suburb of Boston. In the latter, Hyde Park, and later in Mattapan, George showed an early ability in music, later serving as organist in his father’s church, the Church of the Holy Spirit in Mattapan. In later years this interest in music continued, and he participated in the activities of the Cecilia Society, the Handel and Haydn Society, the Harvard Alumni Chorus and the Sängerfest, besides being a regular attendant at the concerts of the Boston Symphony Orchestra, throughout his life. I hope that in spite of my prolonged silence you will not consider me an ungrateful fellow. It is impossible for me to say in a few words how much I enjoyed the three days which I spent at The Rocks. My visit besides being the source of much immediate pleasure has left with me the refreshing picture of a corner of the universe where the beautiful and the ideal are very fully realized and where true happiness exists. “Dr. Magrath was a very excellent teacher. In his earlier days in pathology his demonstrations were popular with students. He was enthusiastic, systematic and clear in didactic teaching, a quality which became even more evident in his lectures later on, when he was giving instruction in legal medicine. These he aptly, often dramatically, illustrated from his personal experience in a way to make remembered the facts he was bringing to his class. “Trained under Councilman and Mallory and with practical experience at the Long Island, the Carney, the Cambridge, the Faulkner and St. Elizabeth’s hospitals, Dr. Magrath became an excellent pathologist. His technique in the performance of an autopsy was masterly, and his keen observation recorded many details, some of which might, and often did, prove of the greatest importance in fixing the responsibility for a crime of violence. In his earlier work, when he was assistant to the secretary of the Massachusetts Board of Health, he began to show qualities, which made so successful his long years in the office of Medical Examiner. He was set to study the adulteration of sausages. Treating these as a body tissue, he hardened, embedded, sectioned and stained. The paucity of striated muscle fibers and the excess of starch granules, which he identified as corn meal, were convincing evidence of the richness of the adulteration of the original sausage. 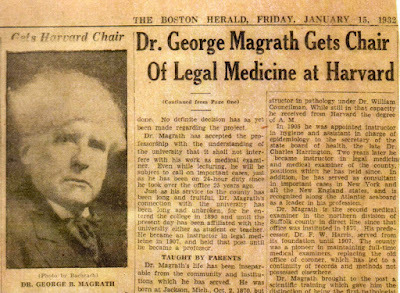 “In 1907 Governor Curtis Guild appointed Dr. Magrath Medical Examiner of the Northern District of Boston, an office which had been created in 187 and for thirty years had been held by Dr. F. A. Harris. For the next twenty-eight years Dr. Magrath competently filled that position. In this office Dr. Magrath rapidly became recognized as a leading expert in New England in the solution of the problems of crime by violence. His fine basic training in pathology, his skill and exactness in post-mortem examinations, his logical processes of thought and exposition, his intellectual independence, his unquestioned honesty and courage, made of him an expert in court and out, whose opinions carried the greatest weight. To be cross-examined was a challenge to his knowledge and intellectual acumen which he enjoyed; rarely could he be caught unawares by opposing legal talent. More and more were his advice and his opinions sought beyond the bounds of his own district; more and more was his help asked by others in similar offices, so that his influence in legal medicine steadily increased. When New York City was planning changes in its plan of legal medical work, Dr. Magrath was an important advisor. “He would arrive at the morgue with his secretary. They’d change to white robes and enter the amphitheatre. More often than not, there’d be no students or other outside witnesses. Harry Kingston, head ‘Morgue Master’ would wheel in the cadaver. He and my friend Percy would pass the instruments. Dr. Magrath would start dictating. From Harry Kingston and Percy Monk I got the impression that from the moment the cadaver was wheeled in, Magrath was in a mood of deep concentration, though fascination might be as good a word. He dictated his ‘general appearance’ notes; and in their proper order, made the long torso incision, and the removal of the top of the skull. “Now, Mr. Gardner, I come to something which is guess work on my part, but I think I am right. In many cases, the inevitable cause of death was at once apparent to Magrath. I believe it was as important to him to discover things that were not the cause of death, as it was to determine the reason why a human machine had abruptly stopped working. “Perhaps Magrath felt he had a unique opportunity, and must be true to his responsibility. . . More than most men, he had the chance and the genius to explore the mysteries which each of us carries within the envelope of the skin. He gave the same careful attention to a repelling ‘floater’ taken from the harbor, as to the well preserved man of distinction who’d happened to drop dead on Tremont Street, rather than in his club, or his home, where his own doctor could have written out a routine certificate of death from normal causes. “This letter is getting long. I’ve made my main point, or hope I have: Dr. Magrath’s devotion over and above the call of duty. Here is a case to indicate his thoroughness, certainly unusual at that time. A man – I believe he was named Saulus – was found dead, many stab wounds. I don’t know the legal disposition of the case. The body was unclaimed. Instead of turning it over for burial in Potter’s Field, Magrath kept it to study those knife wounds. Again and again, with careful notations as to time lapse, he’d study the appearance of those wounds. “Two members of the Harvard class of 1894 liked to race to big Cambridge or Boston fires on their bicycles. At college and through after-life, they developed many another common interest – and out of their lifelong friendship comes now the gift to Harvard by Mrs. Frances Glessner Lee of Littleton, N.H., and Chicago, of a $250,000 endowment for a chair at Harvard Medical School, in legal medicine. “Telling at his St. Botolph Club chambers last night of his gratification at Mrs. Lee’s splendid vision and generous act, Dr. Magrath made the point that, in his own pioneering in the field he has time and again encountered physicians who were diffident about exposing themselves in court to the wiles of lawyers for defendants. This field is now a required one at Harvard Medical and no student is graduated without a pretty thorough familiarity with his responsibilities in this branch of his professional work. “Dr. Magrath – who has held her friendship through the years since their first meeting when, as a college junior, he visited the Glessner home in Chicago with her brother – said that Mrs. Lee has been a generous supporter of the Chicago Symphony Orchestra and has given generously to hospitals and other charitable enterprises in and about Littleton, N.H., where the family has long owned a large estate called The Rocks. 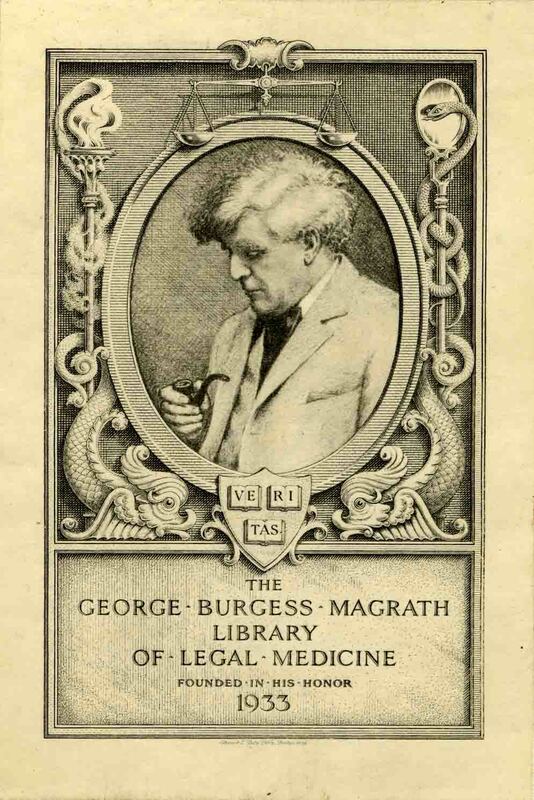 “George Burgess Magrath has exerted a tremendous influence in the field of legal medicine and in the detection of crime. “Dr. Magrath’s life is a splendid example of the manner in which a man’s dynamic personality can spread out over the years, affecting the lives of others long after he is gone. 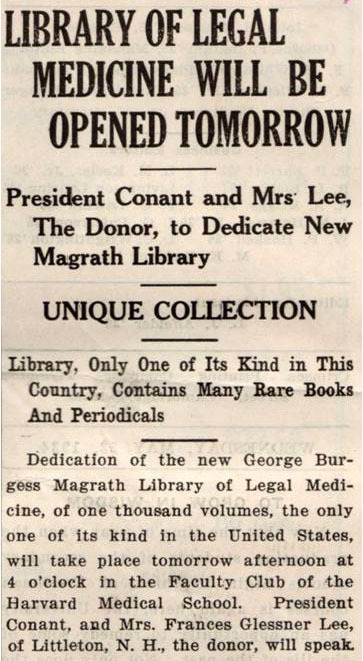 “The fact that Captain Frances G. Lee became interested in legal medicine was due to the influence of Dr. Magrath. The fact that Captain Frances G. Lee invented her famous nutshell studies in unexplained death has been responsible for training hundreds of competent officers so that they can detect murders which otherwise might go not only undetected but unsuspected. “During his lifetime he examined over twenty thousand cases of unexplained deaths, and the present highly efficient science of homicide investigation is in large measure due to the trail blazed by Dr. Magrath. The blaze marks on that trail are Truth, Accuracy, Efficiency and Scientific Integrity. Today many feet follow along that trail, and the wayfarers either follow those same blaze marks or become hopelessly lost in the forest of prejudice. A fitting tribute, indeed, to one whose devotion to his life’s work continues to impact those working in the field to this day. On November 7, 2018, the master bedroom reopened to the public upon completion of an exciting restoration project. 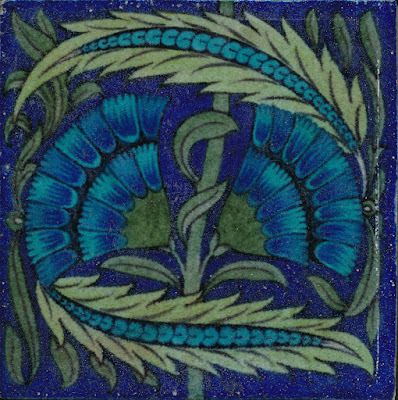 For the first time in 80 years, the fireplace surround once again features the 35 tiles designed by William De Morgan that the Glessners had installed when the house was completed in 1887. The project had been on the Glessner House wish list for more than twenty years and came to fruition through the generosity of long-time museum supporters and volunteers Steve and Marilyn Scott, and The Society for the Preservation of New Hampshire Forests, which returned the tiles to the House in 2017. As work was underway on the Glessners’ new house at 1800 Prairie Avenue in 1886 and 1887, they actively shopped for items to furnish and decorate their home. Among the items selected were several sets of tiles for some of the eleven fireplaces in the house. Two fireplaces – those in the master bedroom and the courtyard bedroom – received tiles designed by the well-known English designer and ceramicist William De Morgan. De Morgan worked closely with William Morris, so the selection of his tiles fit nicely with the other Morris & Co. products the Glessners acquired, including wallpapers, textiles, rugs, and upholstery fabrics. The tiles selected for the master bedroom were of two different designs which were installed in an alternate pattern across the face of the fireplace. 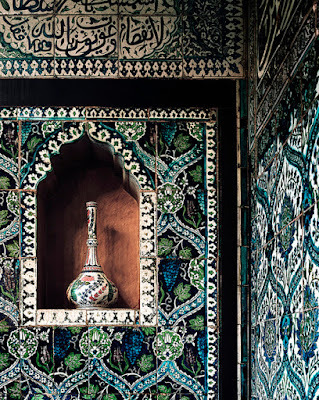 A total of thirty-five tiles, in vivid shades of blue and green resulted in the most vibrant of all the fireplaces in the house. It appears from other decorating choices throughout the house that blue was clearly a favorite color of Frances Glessner, so it is no surprise that she would have selected the tiles for her most private space in the house. To finish off the fireplace, the Glessners selected an antique brass surround that probably dates to the mid- to late-18th century. 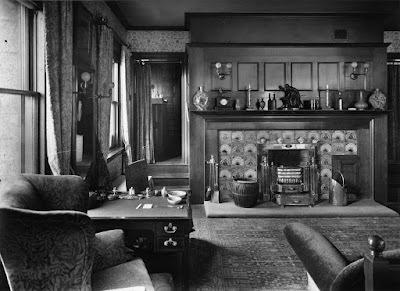 Frances Glessner noted in her journal that they visited numerous antique shops in Boston purchasing fireplace fittings for their new home, so that is most likely the origin of the surround they selected for this room. After the death of Frances Glessner in 1932 and John Glessner in 1936, their daughter Frances Glessner Lee spent a year seeking out an organization or institution to which she could donate her parents’ home. After reaching an agreement with the Armour Institute (now the Illinois Institute of Technology) to accept the building, she arranged for the removal of three sets of fireplace tiles, including those in the master bedroom. She was in the process of building an addition to her cottage at The Rocks in New Hampshire and had three fireplaces designed specifically to accept these tiles. Those from the master bedroom were placed in her library/office where she could enjoy them while sitting at her desk. The master bedroom at Glessner House received new tiles made by the American Encaustic Tiling Company. Featuring a very dark green matte glaze, they did nothing to indicate the vibrancy of the original tiles. 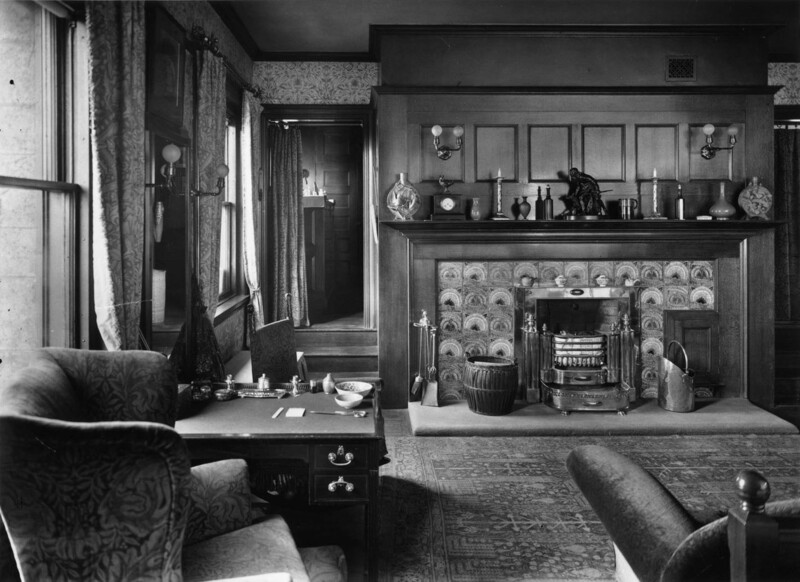 The firebox was also rebuilt to a different size at this time, and the brass surround was removed and shipped to The Rocks, although not used in Lee’s library/office with the De Morgan tiles. Frances Glessner Lee died in 1962 and her family continued to occupy the cottage until the death of her daughter, Martha Lee Batchelder, in March 1994. 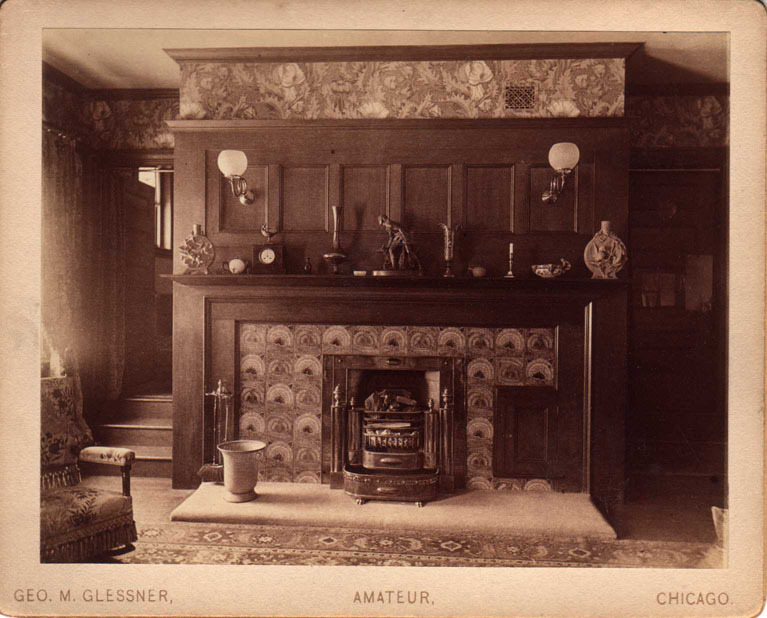 Batchelder had been instrumental in returning many of the original furnishings to Glessner House, and it was her desire that the fireplace tiles would eventually return to the House as well. However, she died unexpectedly while vacationing in Bermuda, and that wish was never put down in writing. The cottage was sold soon after, and through the years, attempts wee made to retrieve the tiles from the new owner, but all efforts were unsuccessful. In 2015, the cottage was purchased by the Society for the Protection of New Hampshire Forest, which had been gifted the adjoining property constituting the majority of the original The Rocks estate in the 1970s by Frances Glessner Lee’s children. Knowing of the long interest we had in obtaining the tiles, the Society contacted us and offered the three sets of tiles as soon as they could be safely removed and transported back to Chicago. The tiles were removed in late 2016 and were then driven back to Chicago in the spring of 2017. With the tiles safely back at Glessner House, work began in earnest on planning for their reinstallation. Long time docent Marilyn Scott, and her husband Steve, an active volunteer at the house, provided funding for the project in recognition of their 50th wedding anniversary. The Chicago Chapter of the Daughters of the American Revolution gave the house a grant to restore the 18th century brass fireplace surround. Amazingly, although the tiles had been installed and removed twice, only one had been lost. 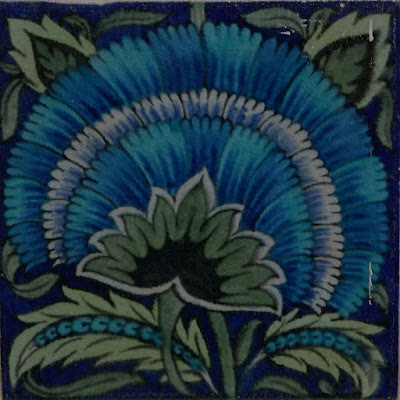 Victorian Ceramics, a British company specializing in replicating De Morgan tiles, created the missing tile. Berglund Construction was engaged to undertake the project which involved removing the tile installed in the late 1930s, rebuilding the firebox to the original size and reinstall the tiles. The project was complex in that metal straps and flanges on the brass surround were meant to fit into the brickwork to secure it in place, so precise measurements were taken to ensure the rebuilt firebox would accommodate the surround. An interesting bit of information was uncovered during the project. Many of the tiles had a notation on the reverse painted in black noting “TOP” followed by a number. 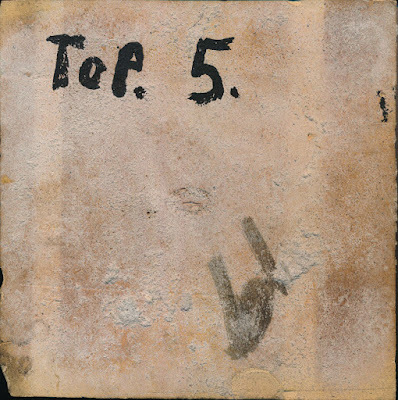 It was quickly determined that the notations were painted onto the tiles in 1887 to indicate their exact placement on the fireplace. The notation was still visible on 25 of the tiles, resulting in those tiles going back in exactly the position where they had been installed 131 years earlier. As work was underway on the fireplace itself, accessory items were acquired to replicate the appearance of the fireplace in historic photographs. This included identifying the original brass jamb hook for holding the fireplace implements as well as the original brass coal tongs. Modern brass tools including a broom, shovel, and poker, were acquired to match the originals. Photos also revealed that the Glessners lined the coal basket with newspaper before filling it with cannel coal – a premium grade of coal that burned longer and brighter than regular coal. A basket which sat on the hearth would have held newspapers waiting for use in the fireplace. A splint wood basket of similar proportions was acquired, as was an 1889 Chicago Tribune, part of which was placed in the basket, and part of which was used to line the coal basket. The results are absolutely stunning. The tiles are as vibrant as they were the day they were installed in 1887. Visitors to the House today would never know the long journey the tiles have experienced, were it not for the enthusiastic docents who greatly enjoy sharing the story! The following article on the life of William De Morgan was written by Loyola University student Andrew Haberman, who worked as an intern at Glessner House in the fall of 2017. William De Morgan was born in London in 1839, the second of seven children. He came from an intellectual family, with both of his parents engaged in the social and academic atmosphere of the period. At age 10, De Morgan attended University School, and he proceeded to University College at age 16. Following this education, he enrolled at the Royal Academy as an art student in 1859, and by 1862 had his own studio. In 1863, De Morgan met the man who would become extremely important in his career as an artist: William Morris. Morris was one of the leading minds of the Arts and Crafts movement. This goal of this movement was to provide an alternative to industrialization and promote the value of work completed by the hand of an artist instead of an industrial machine. Morris was a talented man, but his strength was not in ceramics, so he and De Morgan decided to collaborate. De Morgan went to work for Morris, Marshall, Faulkner & Co., specializing in the ceramic production business, but also making designs for various works such as stained-glass windows. 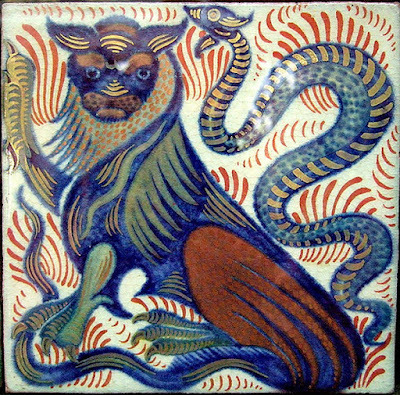 By the late 1860s, De Morgan became interested specifically in tile making, and made enough tiles in his free time to show to his friends. 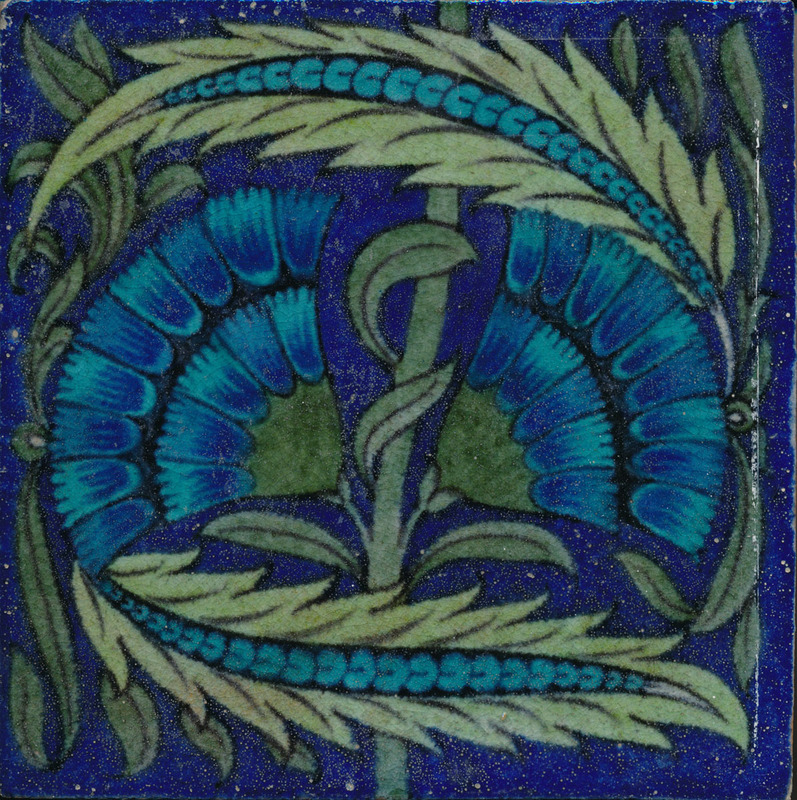 He would later claim that he only made three tiles for Morris’s company, but the beginning of his interest in tiles came during his time with the firm. After the fire to his previous place of residence, William De Morgan moved into his new home in Chelsea, where he began to work under his own firm. The firm specialized in decorated tiles and pots. 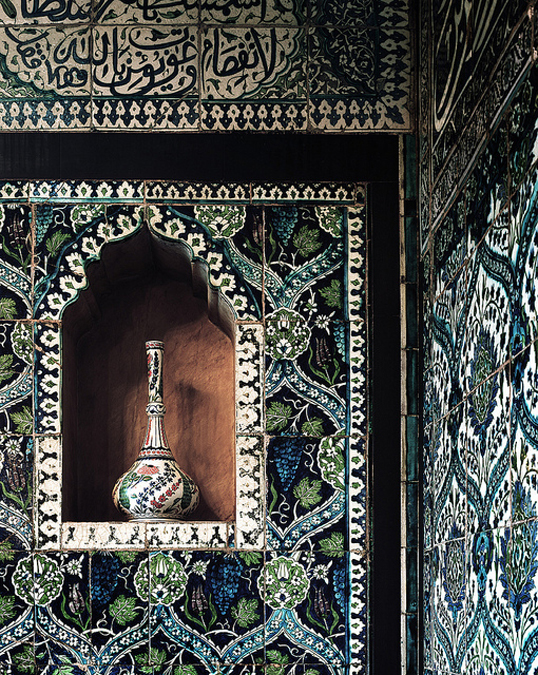 During this period De Morgan showed interest in sixteenth century pottery, especially coming out of Iznik, Turkey (the fireplace tiles in the dining room at the Glessner House are examples of this style). He also gained wider recognition for his exact copies of sixteenth century tiles made to complete a set of originals for the influential Lord Leighton (pictured below). After this commission earned him more recognition, De Morgan continued working in the “red luster” style, and gained several other influential clients, including Tsar Alexander II of Russia. De Morgan’s next home was in Merton Abbey, and he created many of his best-known works during this period. In order to fund his growing business, De Morgan secured what would become a ten-year partnership with businessman Halsey Ricardo. The tile designs produced during this period are notable for their increase in size (up to 8” per tile, the size of the master bedroom tiles at Glessner House), and more complex imagery. De Morgan also began working on ship tiling, again completing commissions for Tsar Alexander II. On a personal note, De Morgan married fellow artist Evelyn Pickering in 1887 (whose painting “Flora” is pictured below), and they remained together until his death. In 1888, De Morgan moved to Fulham, where he was able to build his own factory for tile and ceramic production. Unfortunately, the physical health of De Morgan deteriorated. He was diagnosed with what was likely spinal tuberculosis, which made London winters especially difficult to bear. For this reason, De Morgan and his wife spent their winters in Florence. This made business difficult, but De Morgan used an inventive technique of transferring drawings onto tiles to continue business in the winter months. Understandably, during this period De Morgan’s work shows a strong Renaissance influence, likely due to his winters being spent in the hub of Renaissance thought. His panels kept growing larger, and he tended to create ships and animals for his tile designs. However, the business struggled with the added strain of De Morgan’s frequent absence, and the company was liquidated in 1907. After the closing of De Morgan’s business, he was able to continue his artistic pursuits through another medium. By 1910 the illness had worn off, and De Morgan and his wife were able to move back to London. There, De Morgan reinvented himself as a fiction author. While historically he is known for his incredible work in ceramics and tiles, the business was never extremely successful financially. De Morgan’s later literary career brought him the financial stability that he had not experienced in his previous career. De Morgan’s books were known for their accurate depiction of what life was like in Victorian London, exemplified by his novel Joseph Vance. William De Morgan died in 1917 of an infection, leaving behind an astounding legacy. The accomplishments of William De Morgan are numerous and extend beyond the reach of his most known artistic outputs. He was arguably the most important ceramics designer of his era, and his works contributed significantly to the popularity of the Arts and Crafts movement. His work on tiles was innovative in style and content. He was known for creating animals that had an appealing quality while refraining from looking like human features. The ways in which he produced tiles, specifically the drawing transfer technique that he used during his stay in Florence, also changed how tiles were produced. 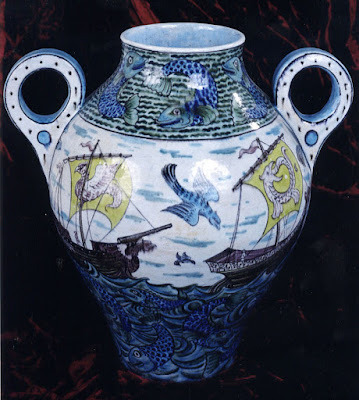 The use of the lusterware style also became revived due to De Morgan’s work, as it had most recently been popularized in the sixteenth century. This technique can be seen in most of De Morgan’s works, with a thin metal film covering the surface and creating a shimmering look that is unmistakable. Outside of ceramics and literature, De Morgan was also a casual chemist, bicycle designer, telegraph code writer, and World War I defense strategist. Glessner House is privileged to house multiple objects made by William De Morgan. The most prominent objects are the tiles in the master bedroom and courtyard bedrooms. 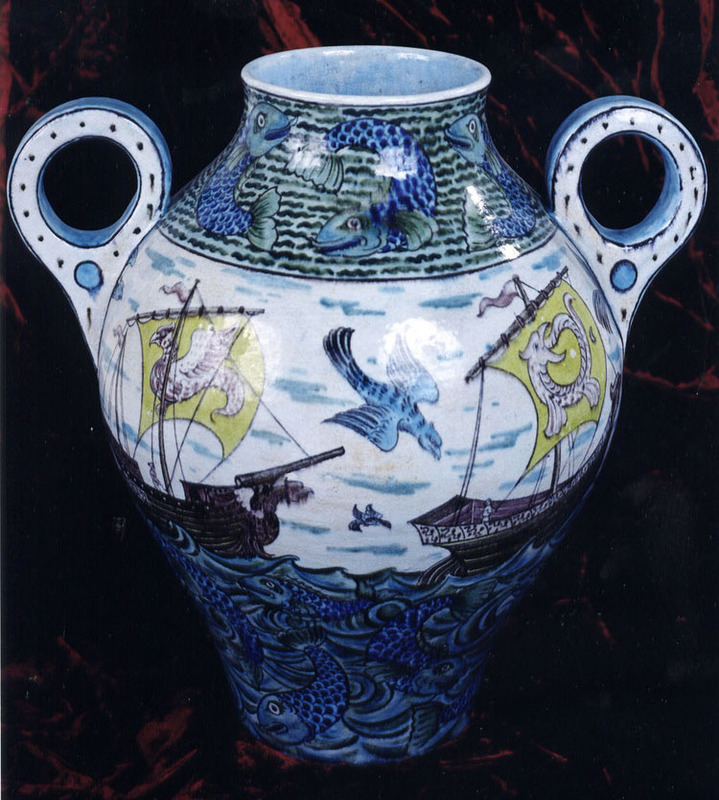 The House also contains a colorful loop-handled vase (shown above) in the parlor depicting birds and ships on the ocean, and two large chargers in the main hall, one depicting a dragon, the other two Pan figures surrounded by various animals. Following, we reprint the article that appeared in The Manchester Union on November 20, 1943 regarding her appointment. “Mrs. Frances Glessner Lee of Littleton has been appointed a captain of State Police by Col. Ralph W. Caswell, superintendent of the department, in recognition of her work in promotion of scientific crime investigation, it was disclosed today as nearly 150 county solicitors, medical referees, sheriffs and local police chiefs gathered here for the second seminar on collection and preservation of scientific evidence in cases of violent death. “Mrs. Lee, who sponsored the founding of the department of legal medicine at Harvard Medical school, and whose work has been recognized by many states and several foreign countries, has been collaborating with the New Hampshire State Police for about two years and is one of the sponsors of the annual seminars, the first of which was held in December 1942. “A native of Chicago, she is the daughter of the late John J. Glessner, long time Littleton resident, and a sister of John G. M. Glessner, who was representative from that town. She has been a legal resident of Littleton for over 15 years. 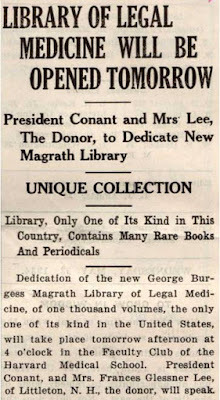 “Besides the founding of the department of legal medicine at Harvard, Mrs. Lee established the George Burgess Magrath library of legal medicine there in honor of a college classmate of her brother and long prominent medical examiner. “From the study and advancement of legal medicine, Mrs. Lee became interested in and made exhaustive studies of police work generally, both in the United States and abroad, and for the past two years has been actively interested in and has cooperated with the New Hampshire State Police, which, she declared today, she considered to be unexcelled in the country. “Colonel Caswell, in disclosing the appointment of Mrs. Lee to a captaincy, announced that she will serve as a volunteer consultant. He paid his tribute to the new officer for her work in the advancement of scientific investigation and asserted that the department is extremely fortunate to have her help. “Speakers at the seminar today, which was preceded Thursday evening by classes held for members of the state police, were Dr. Alan R. Moritz and Dr. Joseph T. Walker of the department of legal medicine of Harvard Medical school, who also are attached to the Massachusetts Department of Public Safety. NOTE: From March 23 to 30, 2019, Glessner House will host a series of special events honoring Frances Glessner Lee in conjunction with the official opening of her restored bedroom. Events include a black-tie gala, a birthday party (Lee was born March 25, 1878), a screening of the 1950 MGM film Mystery Street (featuring the Department of Legal Medicine at Harvard), a lecture “Anatomy of a Restoration” focusing on the process of restoring her bedroom, and a presentation “Murder in a Nutshell” where audience members delve inside for of her Nutshell Studies to try and determine – was it suicide, accidental death, or murder? Look for more information on these events in early 2019 at www.glessnerhouse.org. At 3:00pm on Sunday April 15, 2018, Glessner House will host a special program commemorating the 106th anniversary of the sinking of RMS Titanic. Being held in partnership with Friends of Historic Second Church and the Greater Chicago Chapter of the Victorian Society in America, the program will take place at Second Presbyterian Church, where organist John Sherer will perform music from 1912, music performed aboard the Titanic, and music written to honor those who perished in the disaster. Stories of some of the more than 1,500 victims will be shared, including those with a connection to Chicago. Tours of the National Historic Landmark sanctuary and a reception featuring dessert items from the last dinner menu served to first-class passengers will begin at 2:00pm. Tickets are $25.00 and can be purchased by clicking here. In the early hours of April 15, 1912, the RMS Titanic, the pride of the White Star Line and the largest ship afloat at the time, sank in the North Atlantic Ocean after hitting an iceberg 2-1/2 hours earlier. Of the 2,224 passengers and crew on board, more than 1,500 perished, making it one of the deadliest peacetime maritime disasters in history. The RMS Carpathia arrived about two hours after the ship went down, rescuing the survivors. 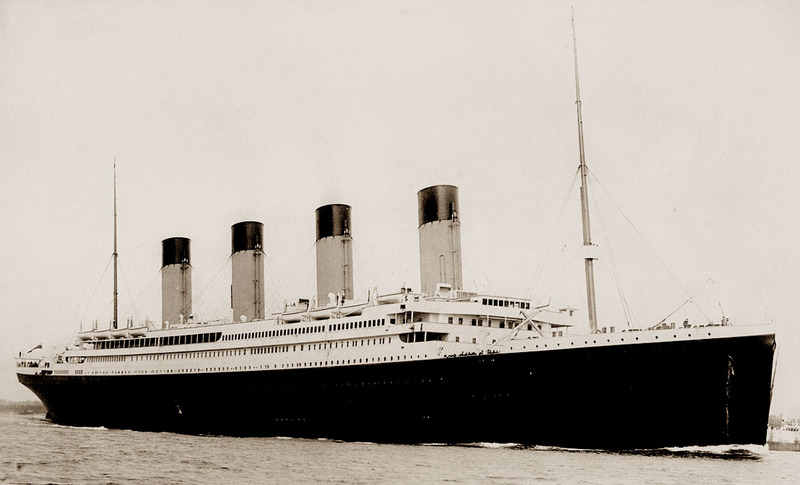 The Titanic was hailed as one of the safest ships ever built, but the severe shortage of lifeboats was the major factor in the enormous loss of life. Significant improvements in maritime safety resulted from the investigation which followed. The disaster was featured in headlines around the world. Early reports had incomplete information on survivors, so many family members and friends had to wait days to learn the fate of their loved ones. The death toll increased as more information became available. The first headline in the Chicago Tribune from April 16 (shown above) showed 866 survivors; the final count was just over 700. Ann Isham was born in January 1862. Her father, Edward Swift Isham, was a prominent Chicago attorney and was a partner with Robert Todd Lincoln in the firm of Lincoln, Isham, and Beale. She joined Second Presbyterian Church in 1883 and was an active member of Chicago society for twenty years, being a member of both the Friday and Scribblers’ clubs. In 1903, she moved to Europe where she spent most of her time living with her sister Frances (Mrs. Harry Shelton) in Paris. On April 10, 1912, she boarded the Titanic at Cherbourg, France, traveling to the United States to spend the summer with her brother Edward “Ned” Isham in New York City. Isham was one of 144 first-class women aboard the Titanic and one of only four to perish. The fact that space on the lifeboats was given first to women and children has led to speculation as to why Isham did not survive. Although it has not been proven, it is believed that she refused to leave her beloved Great Dane behind. One account stated that she had already boarded a lifeboat and when she was told she would have to leave her pet behind, she jumped back on to the Titanic. A female victim was observed to have her arms frozen around her dog in the water following the sinking, but it is not known if the woman was Ann Isham. Her body, if recovered, was never identified. The family erected a memorial to her in Manchester, Vermont, where they maintained their summer estate, Ormsby Hill. The story of Arthur Ryerson was a double tragedy. Ryerson, who was 61 at the time he went down with the Titanic, was born and raised in Chicago, the son of Joseph T. Ryerson, founder of the iron and steel company of J. T. Ryerson & Co. Arthur Ryerson had served for many years as the president of St. Luke’s Hospital. 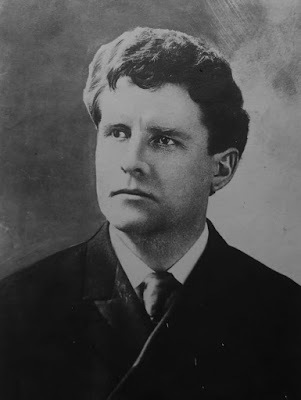 The Ryersons left Chicago about 1905 on account of Arthur’s health, residing in a country home at Otsego Lake in New York. They maintained close ties to Chicago, visiting frequently. In the spring of 1912, Arthur Ryerson, his wife Emily, and three of their children traveled to Europe and by early April had taken a house at Versailles for two months. No sooner had the family settled in then they received word that Arthur Ryerson, Jr. had been killed in an auto accident in Philadelphia. The Ryerson’s son was just 20 years old and a student at Yale. Anxious to return to the United States as soon as possible, they made arrangements for passage on the first American bound liner leaving France – the Titanic – which was set to sail from Cherbourg on April 10. NOTE: Ryerson’s wife and children survived and soon moved back to Chicago. Emily Ryerson, who was described as having a “resilient character,” purchased property on North Lakeview Avenue and constructed one of a series of four elegant Georgian townhouses designed by David Adler and Henry Dangler. She moved into her home at 2700 N. Lakeview Avenue in early 1917, soon after converting the large elegant rooms to a convalescent home for Children’s Memorial Hospital during World War I. In 1927 she married Forsythe Sherfesse; she died in 1939. The grouping of row houses, of which hers served as the southern anchor, was designated a Chicago landmark - the Lakeview Avenue Row House District – in 2016.